/ Dee Williams Downsizes from Tiny to Tinier! Dee Williams Downsizes from Tiny to Tinier! 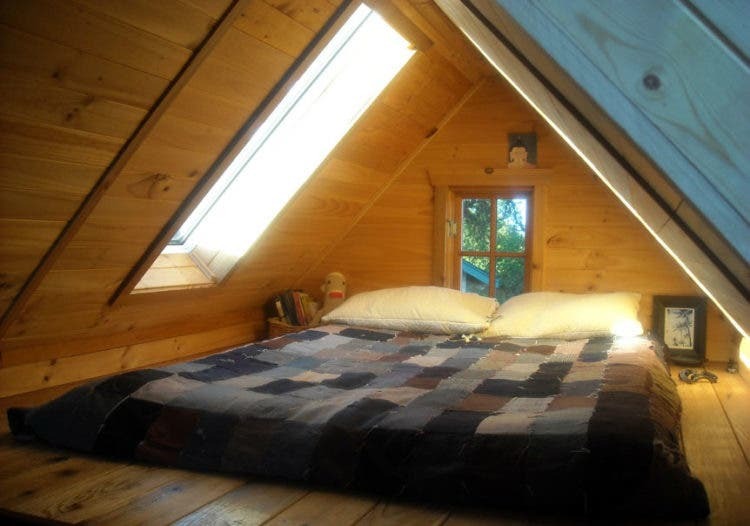 Fans of tiny house blog are probably already open to small home living, but how small is too small? And is “too small” a number, or a feeling? 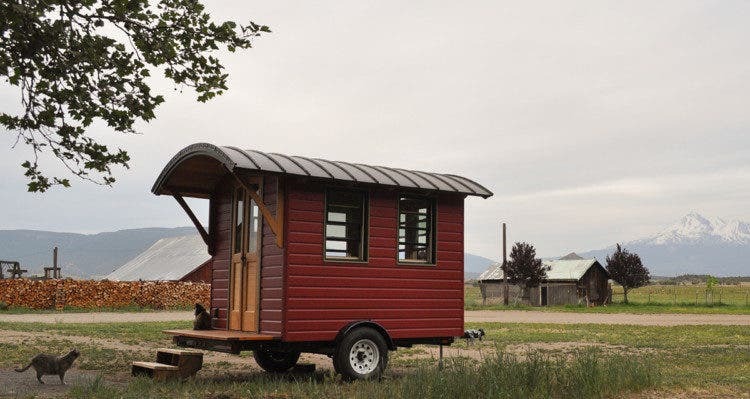 Dee Williams is fixing to answer those questions by downsizing…from the 84 square foot tiny house she’s lived in for 13 years, to a 56 square foot tiny house. 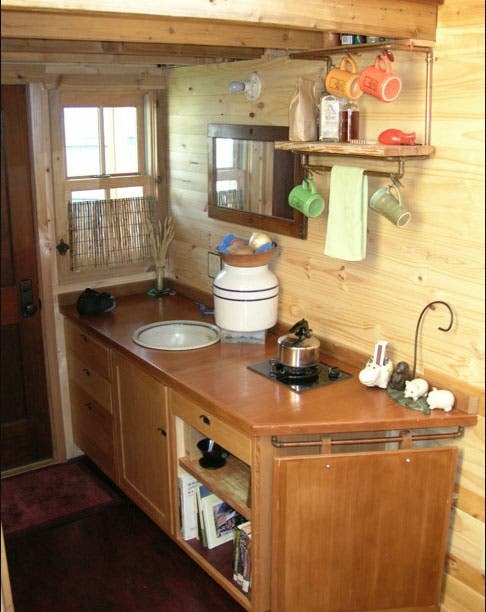 Dee has been an icon of the tiny house movement for almost as long as it’s been around. 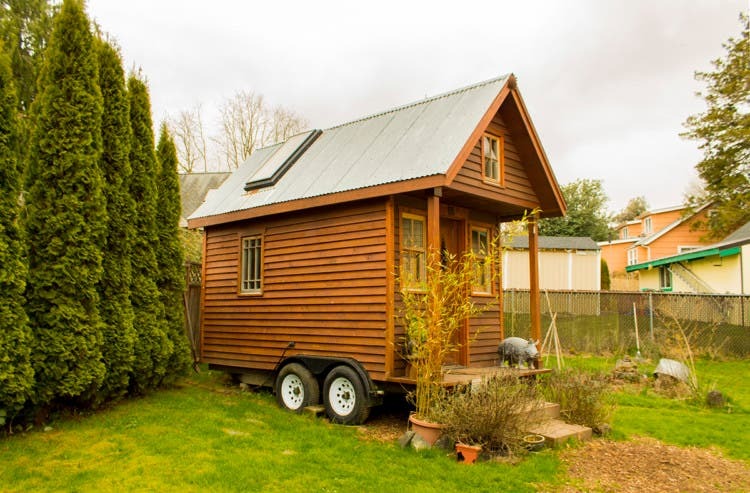 Her tiny house on wheels in Olympia, Washington was one of the first tiny houses out there, and she’s been educating DIY tiny house builders with tours, books, plans and workshops for years. Her memoir about her life and move into the house, The Big Tiny, came out in 2013, and she traveled coast to coast to educate audiences about what it’s like to live a little more simply.In 2013 she also had a second tiny house built: her own Don Vardo tiny house design, which she uses as an office and second home when she stays in Portland, Oregon. She started kicking around the idea of moving into the 56 square foot Don Vardo, nicknamed “Jolene”, but didn’t get serious until she found a good recipient for her current tiny house: her nephew Jonathan, a recent college graduate and river rafting guide who’s comfortable living in a tent for months at a time. When Jonathan took an interest in the house and announced he was moving to Colorado, Dee hatched a plan: she’d drive her current house the 1,500 miles from Olympia to the Tiny House Jamboree in Colorado to give it one last moment in the spotlight, give it to Jonathan, and return to Olympia to live in her new, littler house full time. Dee’s current house has been dubbed the “Kozy Kabin” for its relatively simplified design, especially among tiny homes today. Dee’s current house runs largely on solar power, with an often-noted $8 per month utility bill, and doesn’t have running water or plumbing. Living in the shared backyards of friends and not caring much for cooking, this simplified life has worked well for Dee for 13 years. And it still works well. But Dee has always been an advocate for defining home based on the people in your life and experiences you pursue, and her natural tendency is to push the limits she’s gotten comfortable with over the years. Several shifting circumstances in her own life have called on her to question where a sense of home really comes from. She has friends and family coping with illness, and met several folks recently who developed a sense of home even when literally without one: people like John Francis walking across the country with nothing but a backpack. “I love a good living challenge, and Jolene is it. She doesn’t have much of a closet, not that I have a lot of stuff to store. There’s no running water, but I’m used to that. And at the moment, there isn’t a toilet…which is a bit of a showstopper. My plan is to remodel and figure stuff out along the way. I’ll be hatching an adventure just by moving in the first day, which is exactly the situation I found myself in 13 years ago with my current tiny house. I have been, and still am, happy enough in the tiny house, living in the shadow of my friends’ houses and kicking the can down the road with them. I’m safe. I can do this! Dee’s downsizing adventure has already begun, and will only continue from here. 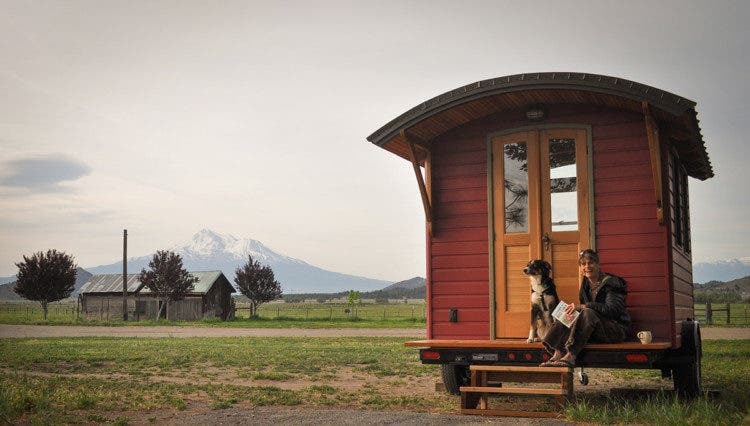 Right now she’s preparing her Kozy Kabin house for its 1,500 mile western road trip with Derin Williams, the tiny house builder behind the Hikari Box and Cider Box tiny homes, en route to the 2016 Tiny House Jamboree. 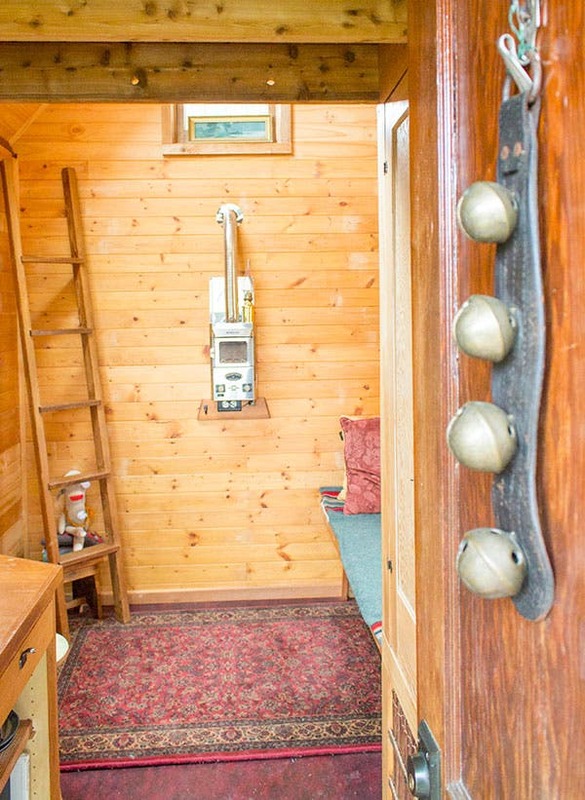 If you’re headed to the Jamboree, you can tour Dee’s famous tiny house before Jonathan takes it home. Dee’s house will be open all weekend for viewing, and she’ll be at the Jamboree to give a keynote speech and officially pass the house to Jonathan at a special community event. 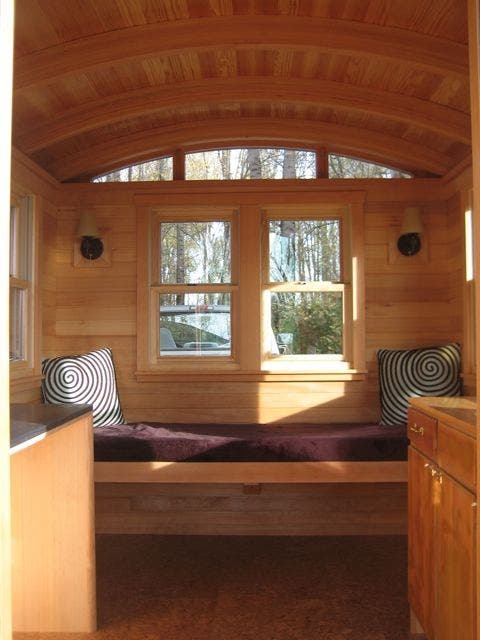 Learn more about Dee’s adventure by visiting the “Tiny to Tinier” page at PADtinyhouses.com. You’ll find Dee’s reflections on Why She’s Going From Tiny to Tinier, her nephew Jonathan’s feelings about Upsizing Into a Tiny House, and Dee’s tips for Setting Up a Tiny House to Run on Solar Power based on her recent experience getting a solar system for her new house. There will be lots more to come, so follow PAD on Facebook or Instagram for educational tips on moving tiny homes, photos from the road, and reflections on mindful tiny house living from a pioneer of the tiny house movement. But the problem is in Europe have any agent where i can make for a quotation and condition? ?